Today is the day! Sweet Stamp Shop's owner, Nicole Rixon is celebrating her birthday and offering you a HUGE discount today through Friday, September 2nd. What's the discount, you ask? Her age! Nicole turns 27 today. Simply enter code HBN27 during checkout to get a 27% discount off your total purchase in the store! In honor of Nicole's birthday, I've made a card using the Cool Scoop stamp set. The card was cut using Nestabilities Labels One dies. I paper pieced the ice cream and scoops with papers from My Mind's Eye Stella & Rose Gertie papers. I added more paper on the top and bottom of the card and tied some Lemondrop twine from The Twinery. The sentiment was made by cutting apart the birthday sentiment from Scootin' By and inserting the word "yummy". That's the great thing about clear stamps--being able to cut them apart and put them back together again. Stop by the Sweet Stamp Shop blog and wish Nicole a "Happy Birthday", then head over to the store and celebrate with a 27% off discount! Happy Birthday, Nicole! Have a sweet day! I joined Penny Black's recent ATC (Artist Trading Card) swap and my partner was Jie Ying who lives in Singapore. We decided to create three ATCs using whatever Penny Black stamps we owned. Here's what I sent to Jie Ying. The first uses some houses from Air Mail, a fun, whimsical set that I won on the Penny Black blog. I ink distressed the sky and ground with distress inks and colored all the images with Copics. The sentiment is by Hero Arts, and I finished it off with a bit of twine and some gemstones. The second ATC uses an older stamp called Brush Tulips. I ink distressed the ATC with Victorian Velvet and Scattered Straw distress inks, and stamped the image with Vintage Photo. I water splotched the surface and stamped the manuscript from Hero Arts. I inked the word "Dream" from a Hero Arts stamp, and added a few pearls to complete the ATC. The last ATC is my fave. I used the dog from Mimi in Paris, colored him with Copics and drew in some grass to ground him. I stamped the sentiment and added some punched butterflies for dimension. See the one on his nose? I love creating ATCs and the challenge to fit a design on a small space. I'll be sharing Jie Ying's ATCs later this week, along with a Penny Black card. Thanks for stopping by! Hope you're off to a great week! Eleven manufacturers are participating in a "Last Days of Summer" blog hop, sponsored by PSA Essentials. One lucky person who completes the hop and leaves comments at all 11 blogs will win an amazing prize package valued at over $300! Here's my card with a summery theme. I used Purple Onion Designs' Summer Noteblock, clear embossed on white cardstock and ink distressed with Shabby Shutters, Scattered Straw, and Victorian Velvet distress inks. The background is clear embossed with Hero Arts' Designer Woodgrain--love how that turned out!--and I embossed several pennants from the Build-a-Banner set. They were ink distressed with Victorian Velvet and Scattered Straw distress inks. The hop runs through Sunday, August 28th at 11:59pm EST. You won't want to miss this chance to win some awesome prizes! Happy hopping! Hi there! 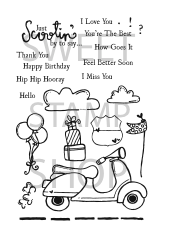 Just sharing a quick card made with the Scootin' By stamp set from Sweet Stamp Shop. I paper pieced the scooter with papers from My Mind's Eye Lime Twist pad, and topped it with a tower of presents. The seat, tires, presents and horn were colored with Copics. I stamped the little puffs of engine smoke, the clouds and sentiment. I'd love to zip around in a colorful scooter like this! The inside reads, "Happy Birthday" and depending on the occasion, there are several different sentiments to choose from. Visit our Flickr gallery to see how customers and the design team used this cute set. Be sure to follow us on Twitter and "Like" us on Facebook, too! Thanks for scootin' by today! 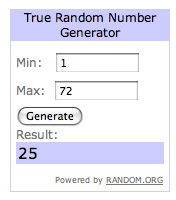 The winner of the "Christmas" theme giveaway, #25, Alle mooie dingen. 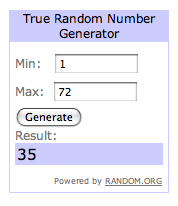 The second winner of the "Halloween" themed giveaway is #35, Scrappy Jackie. 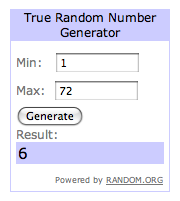 And the winner of the third set is #6, Lindsay. Congrats, ladies! Please email me with your mailing address and I'll get your goodies off to you! Please put "Giveaway winner" in the subject line. I'm sorry that I couldn't give you all some goodies for being faithful followers, but I will be having more mini giveaways in the future. Lots of patterned paper packs and stamps that could use new homes, so stay tuned, ok? Oh, and my birthday present from my hubby is a brand new KITCHEN! We're choosing cabinets, countertops, flooring and a new oven, too. I'll try to share before and after photos of the renovation, and I hope I don't lose my sanity in the construction chaos! With Christmas about four months away, I made my first Christmas card using a Penny Black stamp from last year--Mademoiselle Noel. I love these "fashion girls". They're quick to color and appear to have a sassy chic personality. I seem to be on a green kick lately. I've grown fond of Papertrey Ink's Spring Moss cardstock, which feels like a green version of kraft. The background was stamped with Hero Arts' Magical Background in Peeled Paint distress ink. The image was colored with Copics and I added a bit of Diamond Stickles to the fur trim and her bouquet. I used Reverse Wonky Rectangles--again!--and tied a bit of self dyed seam binding. Some clear gemstones were added for a touch of bling. Done! One card down and many more to go...But it's a start! I hope you're having a fun weekend! There's still time to enter my birthday giveaway here. The Magical Background that I used on this card is one of the stamps up for grabs. I'll announce the winners on Tuesday, August 23rd. Hi there! A heads up that Nicole is offering this adorable set of gnomes--Gnomies-- for 25% off, now through August 20th. The set includes some gnomes, 'shrooms, and a few punny sentiments, too. Here's my card using this sweet set. I stamped Designer Woodgrain background by Hero Arts and punched out a peephole, perfect for two little gnomes. The patterned papers are scraps that were trimmed to fit, and I stamped the sentiment and added a few accent pearls. The gnomes are so cute, and could be turned into Christmas elves in a few months! Hurry over to Sweet Stamp Shop and grab them while they're on sale through Sunday, the 20th. Use coupon code LOVGN25 at checkout. Thanks for stopping by today! I hope you're having a crafty week! This was my birthday cake, eleven days ago. My daughter and her boyfriend surprised me with this yummy cake from Patisserie la Palme D'or. One candle. That's all I wanted. Here are my flowers. My other daughter and son-in-law sent these to me and I loved that they weren't tall and showy. They know that orange is my favorite color. So pretty. For a chance to win a random set, simply become a follower of my blog and leave me a comment. Any comment. Want to guess how old I am? (Be kind...) Any comment will do! You have until Sunday, August 21st at midnight HST to leave a comment on this post. See the clock on my sidebar if you're not sure of the times. I'll draw the names and announce the winners on Tuesday, August 23rd, and I'll ship internationally, too! Thanks so much for helping me celebrate my birthday, and for your timely visits to my blog. Good luck! Hello, and happy Friday! Just sharing a couple of cards made with Stephanie Ackerman's newest images for Purple Onion Designs. I made a card for a baby boy and a baby girl, just by changing the colors. The images were colored with Copics, and I chose different sets of words for each sentiment. A small bow was added on the girly bear, and both backgrounds were stamped with Large Canvas Stripes from Hero Arts. Remember that for one week, all stamps are 25% off when you use the code SUM2011 upon checkout. See all the new stamps here, and help celebrate Purple Onion Designs' 8th Anniversary. Hurry, the sale ends on Sunday, August 21st! From now until Saturday at Sweet Stamp Shop, Nicole is featuring Hello Beautiful at a 10% off savings when you use coupon code HB10 upon checkout. 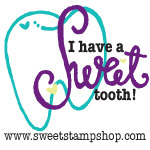 And please join and upload your creations to the Sweet Stamp Shop Flickr group. We'd love to see your sweet creations! New stamps are now on sale at Purple Onion Designs! And to celebrate their 8th Anniversary, Michele is offering a 25% off discount for one week! Go here to see all the new stamps and use code SUM2011 as you checkout. I made a quick card with the Beach Chair set by Michelle Clement. The set includes a beach chair with umbrella, a beach bag, and some handwritten sentiments. I went the simple route and color washed some watercolor paper with Broken China and Antique Linen distress inks, then stamped the beach chair with Versafine ink when it was completely dry. I decided to turn it into a Polaroid shot and stamped the sentiment below. The background is Hero Arts' Large Canvas Stripes, and the seam binding was dyed with Glimmer Mist in Chocolate Covered Cherries. I'll be sharing more cards soon. Thanks, always, for stopping by! Hello there! I'd like to share a card made with the new "Hello Beautful" stamp set from Sweet Stamp Shop. It features a lot of "girly" images--nail polish, lipstick, and some fun sentiments, too. I chose the hair dryer and paper pieced it with some My Mind's Eye papers. I added a strip of paper and tied it with some twine, added the sentiment and the card was done! A fun card to send to your BFF for a girl's night out, maybe? 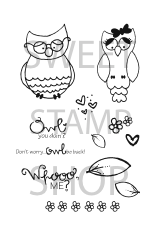 You can find this stamp set on sale here in the Sweet Stamp Shop store. My birthday giveaway is still in the works. 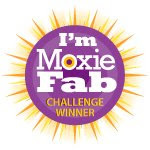 I'm still learning about InLinkz, gathering goodies and will probably divide it into sets, so more people can win! And visit here and here to see if you were one of the "B" winners at Purple Onion Designs and see what the design team has cooked up with the new images. All the new stamps will go on sale tomorrow, August 10th, in the POD store. Thank you so much for stopping by today! See you soon! Hello there! No cards to share today, just a few little tidbits. Purple Onion Designs is having a mini stamp release on Wednesday, August 10th, and to celebrate this, Michele is having a giveaway guessing game here. The seven sets all have a common theme--they start with the letter B. You have a chance to win some stamps simply by guessing the 7 "B" words. How fun is that? The deadline to enter is midnight on Sunday, August 7th, so start guessing! A few weeks ago, Max Shpungin emailed me saying that he wanted to feature my blog on his website, Be @ Home, which features the latest trends in fashion, home decor and arts and crafts. I was flattered to be showcased and my humble blog, along with 29 others, was featured here, as "Best of the Web." Take a look and you'll spot some other familiar blogs (yay, Alice!) and we'd love for you to check it out! 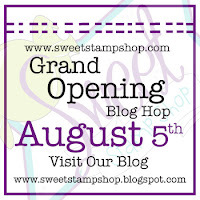 I hope you all hopped along with us at Sweet Stamp Shop's grand opening blog hop. You have until 11pm on Monday, to leave comments on all the blogs for your chance to win some sweet stamps! Winners will be announced here on Wednesday, August 10th. Thanks for stopping by today....I'm coloring up a storm, looking forward to sharing some cards next week, along with my birthday giveaway! Hope you're having a wonderful, crafty weekend, and thanks for stopping by! 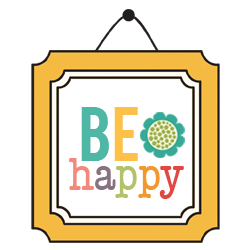 Welcome to Sweet Stamp Shop's inaugural blog hop! Get ready for lots of sweetness and you might even feel a little toothache with all the sweet samples we have in store for you! I hope you arrived here from Tracy's amazing blog. If not, start at the beginning here at Sweet Stamp Shop because along the way, there are hidden "codes" on random blogs that will offer you a savings on the more stamp sets you buy. 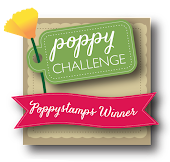 Be sure you leave comments along the way to be eligible for some stamp set prizes. Nicole will choose random names from random blogs and announce the winners on August 10th. Here's my card using Sweet Tooth, a delightfully sweet set of candies and gumballs and more. I stamped the gumball machine and filled it with some gumballs (and jawbreakers!) and colored everything with Copics. 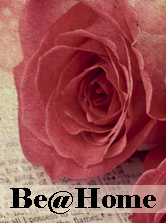 I embossed some lines for texture (á la my friend Elizabeth) and added the sweet sentiment. It's the perfect "just because" card to send to a sweet friend. Remember to hunt for the discount codes on selected blogs and then visit the store which has officially opened for business! The codes are only good from August 5th through the 8th. Your next stop on the hop is the mega talented Teri Anderson. Let's go and check out what fabulousness she's created, shall we? Thanks for stopping by today! Happy hopping and happy shopping! Tomorrow is the day! 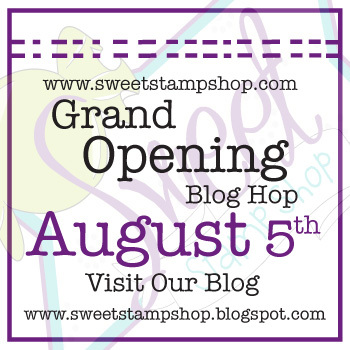 Sweet Stamp Shop's blog hop and grand opening of the store! There's an all star line up of guest designers and a treasure hunt to find shopping codes that offer discounts when you purchase the stamp sets. How sweet is that? Please come back tomorrow to see the full card reveal and hop along with us! It'll be a sweet ride! And....today is my birthday! Yep, me and the Prez. 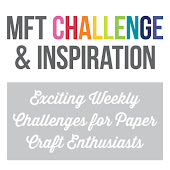 To celebrate, I'll be having a giveaway sometime next week so stay tuned...Stamps, and papers, and punches, oh my! Hello, friends! 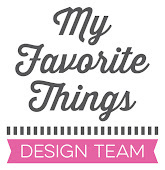 I am so excited to share that I am now on the Sweet Stamp Shop design team! Sweet Stamp Shop is a brand new company specializing in sweet, hand drawn designs by owner Nicole Rixon. 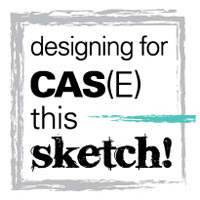 I was surprised when I received an email from Nicole, offering me a spot on her inaugural design team. After seeing her designs, I couldn't refuse! And I was so lucky to meet Nicole and her husband, Jacob, when they arrived in the islands on a recent vacation and she hand delivered my stamps. How's that for service? Go here to read more on when we met, and meet team member Geny, too! For my first card as a design team member, I chose "Melvin and Vernie"--a fun set with a couple of sweet owls and extras, and some punny sentiments, too. Here's my card. I stamped the woodgrain background with this Hero Arts stamp, then stamped and colored Melvin and some leaves with Copics, and attached them with dimensional adhesive. I stamped the sentiment, drew some faux stitching lines and the card was done. Super simple, and isn't he sweet? Want a chance to win this Melvin and Vernie stamp set? Then go here and leave a comment and Nicole will have a random drawing on August 4th. 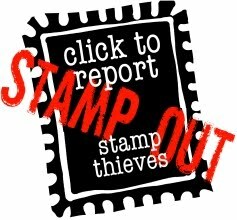 There are seven other stamp sets up for grabs, so make sure you visit each post and leave comments there, too. Visit Sweet Stamp Shop all this week to meet the other members of the design team, and be sure to join us on August 5th for our first blog hop. 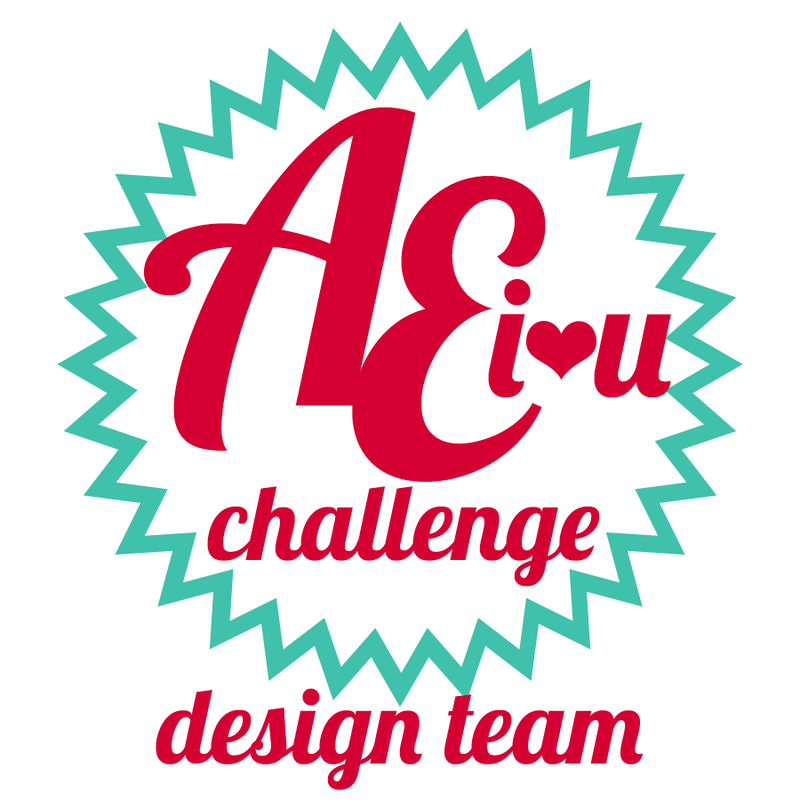 There's an amazing, all-star line up of guest designers, and we'd love for you to hop along with us! Also, follow us on Twitter and "like" us on Facebook, so you won't miss out on all the sweetness! Thanks for visiting today....Have a sweet week!